Circle Square Ranch Summer Camp Contest entry has 4 easy steps: ENTER YOUR INFO, PICK YOUR OFFERS, SHARE THE CONTEST, PRINT YOUR COUPONS! More than once I have been asked about the benefits of sleepover camps for kids. As a little girl I would see the ads for Circle Square Ranch and dream of going some day. It looked like a lot of fun, yet the idea of leaving my home for a full week terrified me at first. By the time I was 9 years old I got to go to Summer Camp for the first time. It wasn't Circle Square Ranch, but it was a fabulous Christian Camp (in Newfoundland) where I got to stay over for 6 days. After a day or two of home-sickness, I soon embraced the Kids Camp routine and loved it! I returned to the same camp for the next 8 years (the last 2 as a junior leader). I can speak from experience when I say that Summer Camp changed me deeply. I was SUPER shy and traumatized by a few negative experiences in my early childhood. I didn't warm up to new people and could barely speak to people I knew well. Many years later my extreme anxiety was given a name...SELECTIVE MUTISM. If you're not familiar with the term, Google it. After years of confidence building activities at Christian Camp (among other programs throughout the year) I had recovered enough to graduate High School, get my first job, and become a Junior Leader in my Church and at Kids Camp. Are you considering whether Overnight Camp is right for your kids? Hop over and check out some information about Circle Square Ranch Kids Camp to see what they have to offer. While you're there, enter the contest. Wouldn't it be great to WIN the trip to Punta Cana? Not to mention FREE camp for your child and Mabel's Labels goodies? "Once the participant enters the contest they will receive one ballot / contest. The participant can receive more ballots by sharing their contest PURL(s) with their online connections. There are 3 easy share buttons at the end of the entry form; Facebook, Twitter and Email, but any and all social channels can be used. They will just have to cut and paste their PURL(s) where they want to share it." 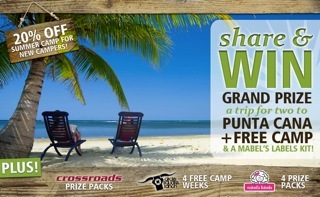 I just entered to win a trip to Punta Cana and a free week at Circle Square Ranch and thought you might like to enter too. Its easy, just click on the link below. For every friend you get to enter you’ll get an extra ballot. Good Luck. "I am a Pioneer Camps & Circle Square Ranch Camps Ambassador. This post has been compensated, opinions expressed remain honest and are my own."